In the spirit of warmer winter weather, I made a hearty and quick avocado salad. 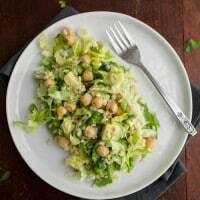 One of the most popular recipes on this site is a simple chickpea/avocado salad (also, good example of how far my photography has come!) I thought I would update it a bit with a couple of additions and tweaks to make the avocado salad a perfect lunch salad. I sometimes forget how awesome different varieties of lettuce can be and I picked up a head of butter lettuce at the co-op the other day that pairs well with the zing of the lime and the creaminess of the avocado. 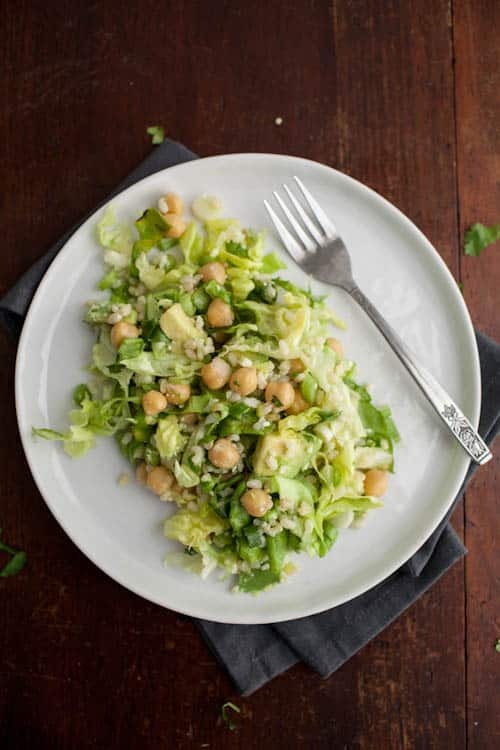 In a large bowl, toss together shredded lettuce, avocado, chickpeas, scallions, cooked rice, and cojita cheese. 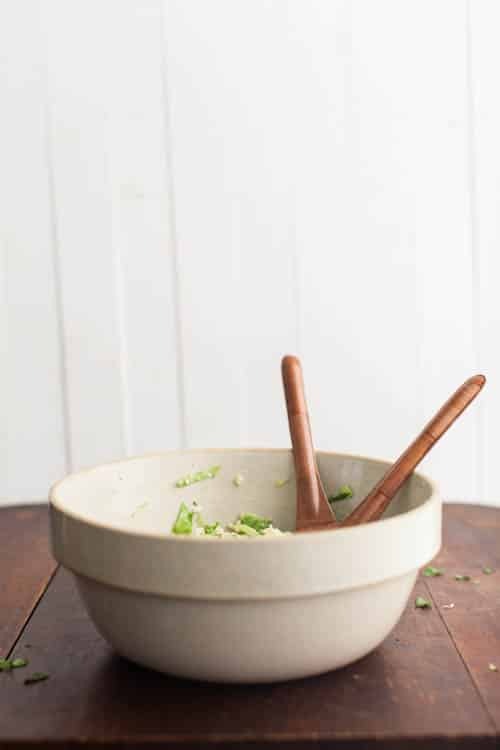 In a separate bowl, whisk together ingredients for the dressing, Pour over the salad and toss until salad is coated. 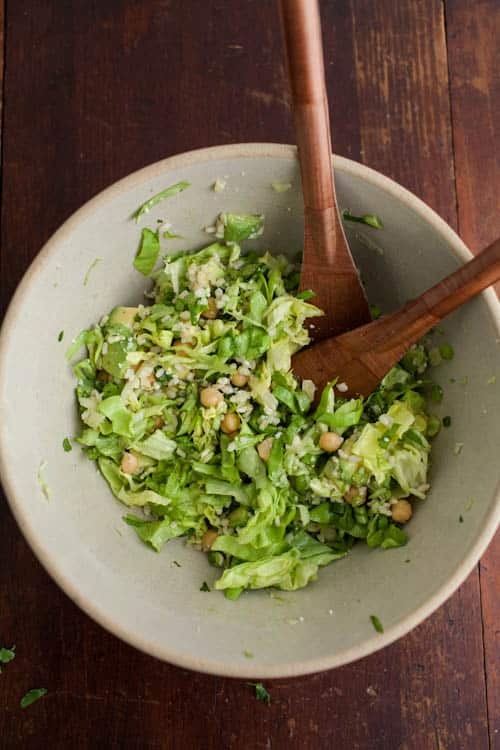 *I used Butter Lettuce for this salad and it was absolutely perfect (it’s one of my favorites!) However, any type would work as would spinach or kale! 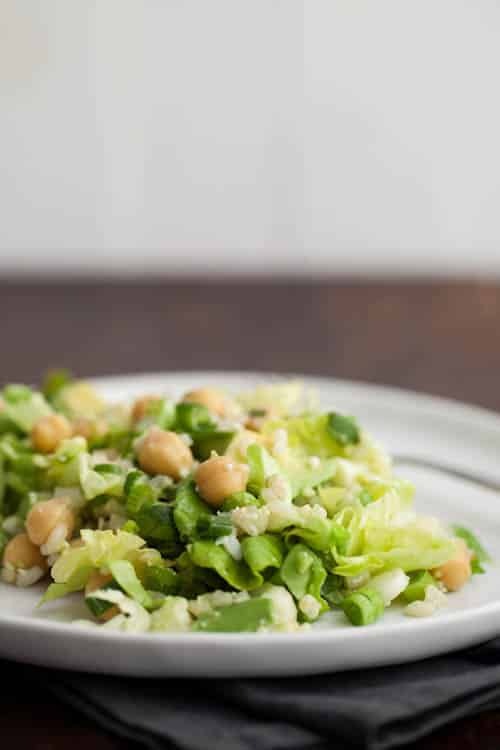 The lovely thing about this simple salad is that it can serve as a base for many additions. I usually make this salad for a quick lunch but it could easily be a nice side for dinner. Vegan: Luckily this salad is fairly easy to make vegan. Drop the cotija cheese and swap in your favorite vegan substitute for honey. Grains: I like to mix up my grains. Einkorn and millet are also really nice in this salad. Lettuce: As mentioned in the notes, I use butter lettuce for this salad (not all lettuce is created equal) but spinach works well. lovely salad. Simple salads like this always turn out to be my favorite and I realize I don’t need to go crazy with the toppings. Less is always more when it comes to salads! BTW I’m jealous of your warm California weather! There is nothing better than seeing your own progress. Being proud of what you have achieved and taking ownership of the journey! Ohhh, I would love to eat a croissant from Tartine Bakery! Lucky girl. I don’t use enough different types of lettuces in my cooking and I agree, it can make a huge difference in the texture and flavor of the final dish. Delicious salad. Added hearts of palm just because I love them and it marries well with everything. This ROCKS!!! SOOOO YUMMY!!! THANK YOU!!! Made this today, very filling and yummy. Used feta because I didn’t have cotija. We liked it, but the flavor of the green onions didn’t stick out. I think a finely shaven red onion would be even better! Would be great topped with chicken. Best salad I have ever had!!! Excellent recipe! I love avocado and usually eat this with eggs, but in this case love the taste in this arrangement! I just tried this recipe and it was soooooo delicious! Thanks!!! Really good, but hella labor intensive. I was worn out after making it, lol.